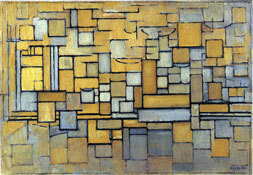 Although painted in a sketchy way, I consider this painting one of Mondrian's most significant compositions. With Pier and Ocean 5 the artist lays out the fundamental principles of a new type of plastic space which constitues the most effective answer to the questions posed by Impressionism, Expressionism and Cubism. A plastic space which lives and acquires meaning in virtue of a continuous process of interaction between subject and object. 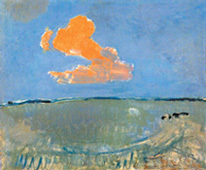 All the external landscapes are concentrated ideally in an inner landscape, an abstract "landscape" that then opens up again to the infinite landscapes of the world. 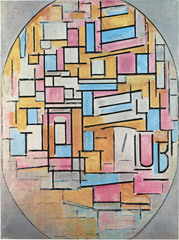 "Art should express the universal" said Mondrian. 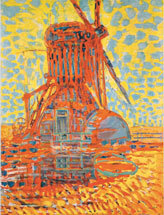 In point of fact Pier and Ocean 5 paved the way for a new way of viewing reality throug painting. 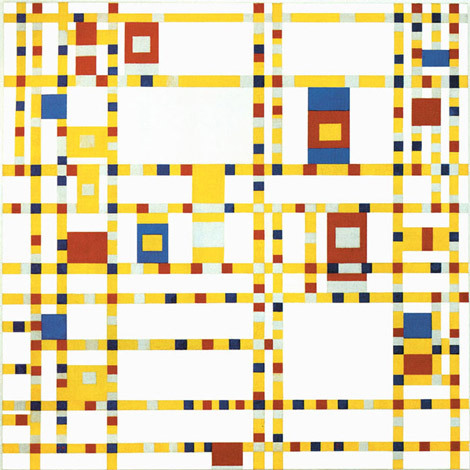 Pier and Ocean 5 depicts in a graphic manner ideas which will be expressed twenty-seven years later in the clearest and brightest form with Broadway Boogie Woogie, the last painting Mondrian was able to complete and a marvellous synthesis of his entire oeuvre. The Museum of Modern Art in New York City are very lucky to have both paintings in their permanent collection. I shall start my explanation of Pier and Ocean 5 by the title. Even though less and less importance attached to the particular and contingent appearance of a certain landscape in 1915, the artist probably saw the pier structure as a man-made, solid element, the symbol of permanence, compenetrating with the dynamic flow of nature (the sea). The vertical pier appears designed to express something more constant while the horizontal sea heralds multiplicity and change. These are issues that go beyond the particular aspect of a certain landscape which, of course, might have stimulated the artist's inner vision. I therefore believe that the real plastic value of Pier and Ocean 5 was drawn more from within the artist himself and the body of work he had previously done, than from the landscape he had in front of him. 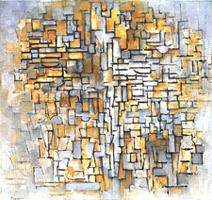 Let us see first how this painting developed by presenting a syntetical overwiew of Mondrian's oeuvre. We shall start with a purely visual introduction and then examine the same in depth through the following text. 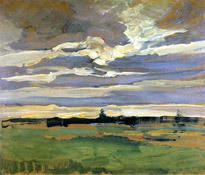 ﻿At the beginning of his work as an artist, Mondrian painted in accordance with the tried and tested canons of naturalistic painting, otherwise known as realistic. 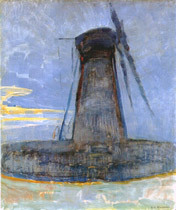 ﻿﻿The painter's attention also focused at the same time on individual objects like a windmill, a lighthouse or a church tower. The painter appears to focus in this phase on expressing contrast, both with the alternation of opposing thrusts and through the use of strong colors. 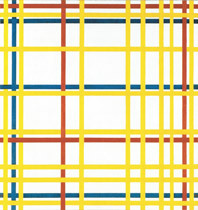 Yellow is opposed to pink or green; red is opposed to blue; horizontal compositions are juxtaposed with others characterized by marked vertical development. 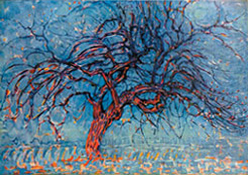 Mondrian was in search of space based on a relationship between opposing entities because he felt in his heart the contrast between the virtually infinite manifold dimension of nature and the finite and individual human condition, between the physical space of the external world stretching away beyond the horizons of sight (especially in the Netherlands) and the mental space internally developed by the human subject; the contrast between expansion and concentration, matter and spirit, multiplicity and unity. The entire existence of human beings is marked by the search for equilibrium and synthesis between contradictory drives. The branches expand toward the sides of the canvas while the trunk leads them back toward the center. Space simultaneously expands (the dunes) and contracts (the buildings) in the figure of the tree. In the tree, the horizontal (symbol of the boundless space of nature) is concentrated in the vertical (symbol of the measured, finite dimension of man). 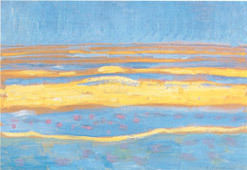 In his writings, years later, Mondrian would talk about the natural as identified by the horizontal and the spiritual by the vertical. 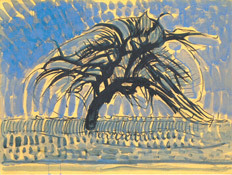 The trunk would thus constitute a metaphor of the unifying consciousness of man addressing the infinite variety of the world which is here symbolized by the branches. In this phase the tree becomes the visual metaphor of a search for equilibrium between contrasting entities such as the manifold space of nature and the spiritual quest for unity. The subsequent abstract compositions of horizontal and vertical lines are already present in the figure of a tree, albeit in a form still veiled by appearances. 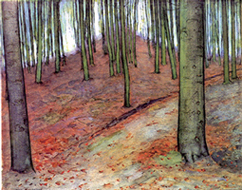 ﻿Why does the Dutch painter see nature and man as contrasting entities? Mankind is part of nature but distinct from it at the same time. There is often conflict in the life of the individual between the natural instincts and what we call intellect, reason or mind, and hence opposition between a part of us that is closer to the natural world and another that separates us from it and often clashes with it. The history of mankind has been a slow and laborious process of emancipation from natural conditions ever since the Stone Age: from huts of mud and straw to houses of glass and concrete; from oxen to tractors; from an average lifespan of 35 years to one of 75. In striving to improve their living conditions, human beings alter the landscape with architecture and transform nature into artifice (the countless objects and tools used for human life today). How are we to define artifice? Is it a natural product or only a human product? And if mankind is part of nature, are the plastic, concrete, and aluminum used to alter the landscape and move more quickly between the continents the result of natural evolution? It seems as if nature creates a "non-nature" through mankind. A curious contradiction. 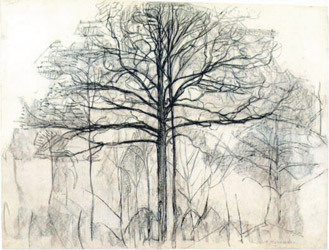 ﻿Between 1911 and 1912 the solid figure of the tree was shattered with the Cubist transformation of space; object and space interpenetrate and thus put an end to the unifying function of the trunk, which dissolves and tends to become one with the many branches. While this happens, space can be seen to thicken toward the middle in some canvases. 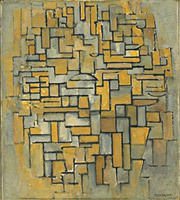 Reading the above four paintings from left to right, this can be seen in the second painting, where a touch of ocher highlights two curvilinear signs that are more closely connected than the others, as though in an effort to hold the space together, in the third painting with two semicircles in the central area that appear designed to evoke a synthesis of the composition, and in the fourth painting where an oval shape unifies the whole composition. 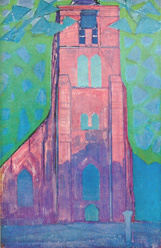 Still curved, oblique, horizontal, and vertical in the first cubist compositions, the heterogeneous variety of signs gradually gives way to a more homogeneous alternation of horizontal and vertical lines. The formal structure of the compositions thus attains greater clarity. By reducing the ever-changing appearance of the world to a multitude of orthogonal signs, the artist unquestionably performs an arbitrary operation with respect to everything we see in the most immediate reality. This enables him, however, to express the greatest possible variety on the canvas (every sign differs from the others in terms of the greater or lesser predominance of one direction or the other) while at the same time maintaining something more constant (the perpendicular relationship). While space is multiplied in a thousand different forms, a common denominator now underpins the multiplicity. Every point of space appears to be different but partakes of the same essence, just as every organism in the world around us appears to be different in reality while sharing the same intimate nature as all the others. 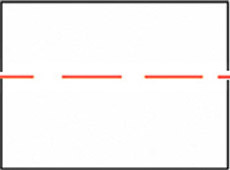 The relationship between horizontal and vertical which we see expressed in a rather univocal and static way in the naturalistic tree ( A), multiplies (B) and takes on ever changing combinations (C). 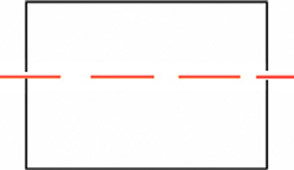 The linear strokes intersect, combine with one another, and separate once again in a constant alternation of the predominance of one direction or the other. Everything is different but can always be traced back to a single intimate reality (the equilibrium shown in the central rectangle) constantly changing in appearance. 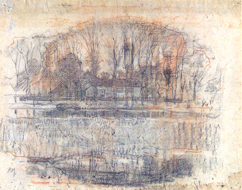 It looks like the painter wishes to condense in abstract terms all the landscapes (boundless horizontal extension), the architecture (measured vertical concentration) and the trees (relationship between opposite drives) he had been dealing with one at the time during the previous years. A tree looks like a small patch of green when seen from distance but then grows larger and reveals an increasing number of parts as we draw closer before finally displaying an enormous degree of complexity when we observe every single leaf. 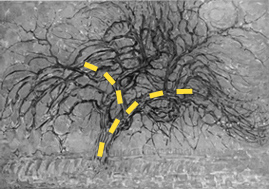 If the process is reversed, the tree loses its complexity and reverts to a simple patch of green. Unity (a patch of green) becomes multiplicity (a complex structure) and then multiplicity reverts to unity. Everything is one and multiple, finite and infinite at the same time according to the positional relationship established in each case with the object observed. How can we paint a reality that changes so quickly today in accordance with the changing positional relationship we establish with things? Does it still make sense to paint a tree from a single viewpoint (A) and claim that this is reality? 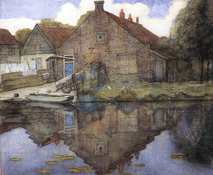 Mondrian, who had moved to Paris by the end of 1911, went to visit his family in the Netherlands in the summer of 1914. He was prevented from returning to Paris by the war, which broke out during his stay. 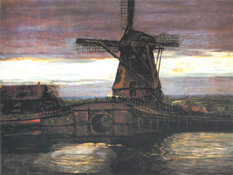 Deprived of the brushes, paints, and canvases left in his studio in Paris, the artist spent time at Domburg where he began a series of drawings, the subject of which, among others, was a pier jutting out from the beach into the waters. 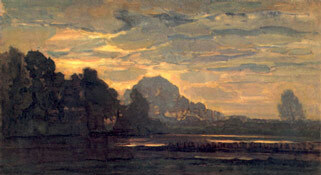 This picture shows a landscape similar to those that the painter must have taken as a model. All four works shown above present an oval form containing the whole composition. 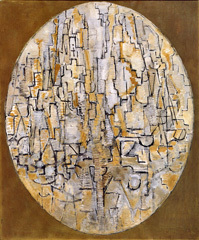 As mentioned, in his efforts to endow the fragmented Cubist space with greater synthesis and unity, Mondrian used an oval in most of the compositions he produced between 1913 and 1915. 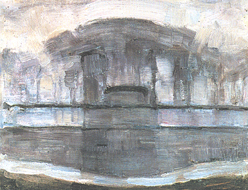 On observing the four paintings above, we see a predominant horizontal extension (1) (similar to the landscapes of 1909-10) compenetrating with a vertical (the pier, that is to say a man-made, non-natural element such as the buildings of 1909-11). 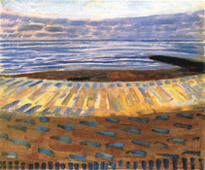 Paintings 2, 3 and 4 show the pier merging with the horizontal (like the trunk of the tree). 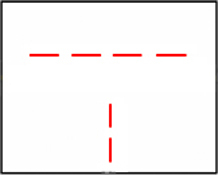 Drawing 1: Two points placed in the central area appear to mark out a segment set slightly below the uninterrupted line of the horizon. 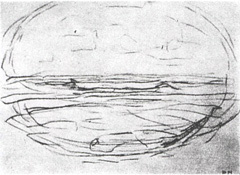 This segment evokes a sense of permanence within the boundless horizontal extension as though the horizon, which continues uninterruptedly to the right and left, had paused and concentrated for an instant inside the composition. 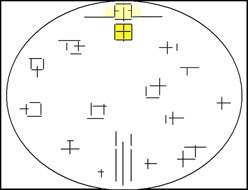 On examining the four compositions in sequential order, we see the segment (1) transformed in the center of 2 into a vaguely quadrangular area that is then concentrated in the upper section (3) to become a group of square areas among which we see a larger and more definite square in the center of 4. The variety of signs finds a more balanced and lasting situation in the square form which is namely an equivalence of horizontal and vertical. The juxtaposition that produces open and unstable situations elsewhere is transformed into interpenetration that generates harmony and permanence in that square. Harmony and constancy between the natural (horizontal) and what tends to differentiate mankind from nature, that is to say, the spiritual (vertical). All around the large central square we see smaller, indefinite square areas interpenetrating with the plurality of different, fluctuating signs all around. They seem to express the progression from caos (the plurality of imbalanced signs) toward equlibrium and a certain order (the square proportion in the center) and vice versa. 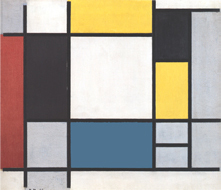 After Pier and Ocean 4 Mondrian begins a new version of the Pier and Ocean group of works which has been catalogued with number 5. The number of signs, i.e. the degree of spatial multiplicity, gradually increases from Pier and Ocean 4 to Pier and Ocean 5 and it is only in the latter that all the signs are expressed solely and exclusively through perpendicular relations. Every sign is unique by virtue of the different type of relationship established in each case between the two opposing directions. Every sign appears different, just as the thousands of entities populating the real space of the world are different from one another. Every sign differs from the others but they all share the same intimate nature (the perpendicular relationship), just as every natural being in the real world is unique and unrepeatable but all express some fundamental characteristics that make it possible to discern an invisible overall design. 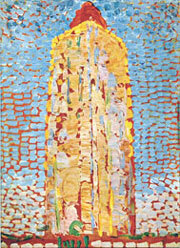 The "landscape" on which the abstract vision is concentrated overlooks the peculiar aspect of each individual thing so as to focus on what the things have in common. 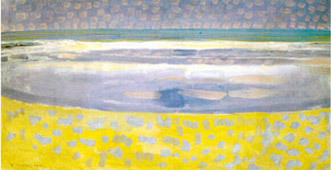 Same as in Pier and Ocean 4, in Pier and Ocean 5 the pier develops from the bottom in the center of the composition. The interaction between nature (the sea) and mankind (evoked here by the pier) generates a whole variety of situations where something changes every instant. Despite its general symmetrical layout, the composition depicts a reality in a state of becoming. The interaction between the upward vertical progression of the the pier and the horizontal expansion of the sea generates a square where horizontal and vertical attain equilibrium. While one direction prevails over its opposite elsewhere, generating the manifold space as a whole, the two directions are equivalent in the square. In other words, though different, they acquire the same value and when the opposites attain equivalence, duality ideally transforms into unity. The juxtaposition that produces open and unstable situations elsewhere is transformed into interpenetration that generates harmony in that square where, for an instant, the plurality of ever-changing signs, a bi-dimensional rendering of the world endless variety, is expressed as one. Mondrian saw the equivalence of opposites as the attainment of equilibrium and harmony between subject (the vertical symbol of the spiritual) and object (the horizontal symbol of the natural). What is the essence of the environmental question if not the search for better balance between men, with all their "artificial nature" (concrete, metal, plastic etc.) and nature as such? And since human beings are part of the natural universe, this essentially means reconnecting a part of nature (mankind) with the whole. 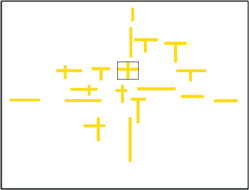 The equivalence generated in the square suggests the possibility of establishing balance and harmony between opposite entities. And this holds both for the subject's relationship with the object (the external world) and for the subject's relationship with itself: finding equilibrium between the contradictory drives within oneself, e.g. between the uncontrollable urges of the instinctual life (nature, i.e. 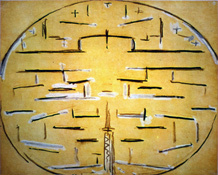 the horizontal) and the action of controlling and guiding the instincts performed by the mind or spirit (the vertical). In some cases, reason and moral rules oppress and limit the vital impulse; in others, life turns common sense and reason upside down. How are we to get by? Disharmony between body and mind; internal imbalances that end up being projected onto the external world to create friction and conflict between individuals and between individuals and their environment. 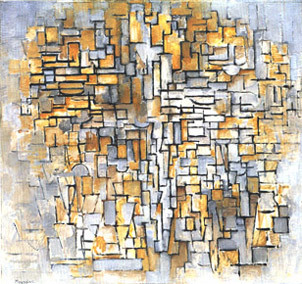 Mondrian's aesthetic space therefore also contains an ethical message calling upon us to balance the opposites and neutralize the imbalances within us before thinking about others and the world as a whole. 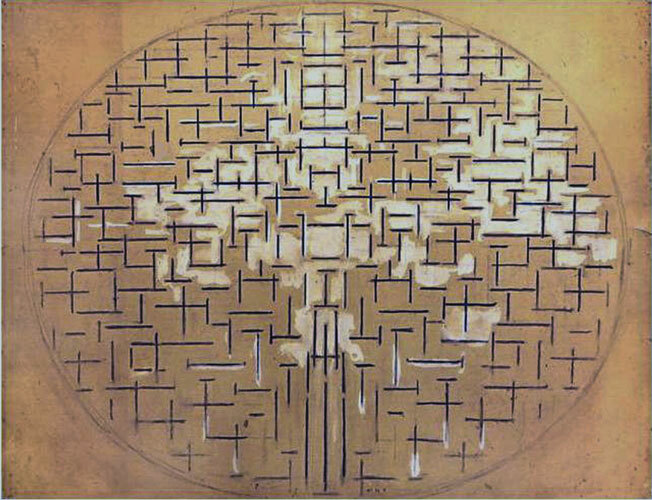 For Mondrian the unitary synthesis is therefore a plastic symbol of the manifold and controversial space of reality, which attains measure and a harmonious condition in the space of consciousness before opening up again to nature and life. This is another reason why modern painting turns abstract: how can you simultaneously represent the outer and inner world if you just look at the external appareance of things through the so called realistic or figurative way of painting? The sign of equivalence between opposites is born inside a square and thus suggests an inner space. This square symbolizes the space of consciousness in which the changing and very often imbalanced external space is captured in a more stable and harmonious synthesis. As pointed out, In that square, for an instant, the variety of ever-changing signs reaches unity. The human search for unity (be it the idea of a God or the unifying theories of science) is always counterbalanced by the multifarious aspect of nature and by the unforeseeable evolution of life. The infinite variety of nature may find a temporary synthesis under the unifying action of the spirit which then must always necessarily open up again to the endless aspects of nature. Human consciousness cannot contain within itself the totality of the world and will never be able to comprehend reality as a whole (the space of the oval). Every synthesis generated by thought is necessarily partial and temporary, and must therefore open up again to the multiform and ever-changing aspect of physical reality. This is what science constantly does. This is what every human being does when, based upon the experience, he changes his ideas of reality. 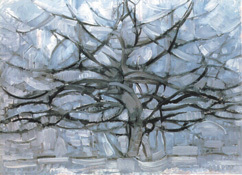 Mondrian thinks of a unity which should be open to multiplicity because he does not believe in a permanent truth to be reached once and forever. Unity is just a human need of thinking the multiple natural universe; translate the infinite physical extension of nature into the finite dimension of thought. 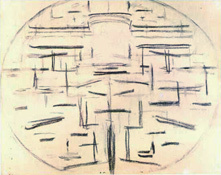 Examination of Pier and Ocean 5 reveals that other areas of the composition suggest potential squares, which do not, however, attain the balance of the one in the center. Unlike the central square, they appear unable to hold the dynamic external space and transform it into a more constant and permanent internal equilibrium. The incomplete attempts to internalize external reality evoke the moments in life when something escapes us and we cannot make the rationale of becoming our own. A second square can be seen in Pier and Ocean 5 above the square that we have identified as a unitary synthesis of the composition as a whole. Inside the second square we see a vertical segment divided by two horizontal segments that extend beyond the boundary of the square to the right and left. 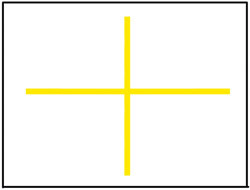 The two small horizontal segments form two crosses with the two vertical sides of the square. These two signs tell us that unity is opening up to duality. The unitary synthesis achieved for an instant in the lower square in the form of the equivalence of opposites is again broken up into a duality that then flows back toward the variety of different situations marked again by the alternating predominance of one direction or the other. The vertical rises, interpenetrates with the horizontal, and produces a unitary synthesis that opens up again to the horizontal higher up. The unity generated with the first square opens up again to manifold space with the second. The synthesis generated by the spiritual quest for equilibrium and unity re-opens to the natural. 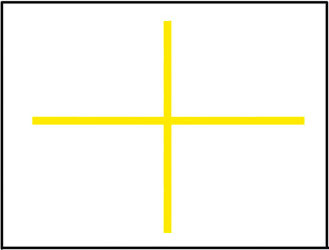 It is in fact the horizontal (a symbol of the natural for Mondrian) that re-opens the square symbol of unity. we have interpreted this as a progression from the multiplicity of different signs toward unit (the central large square) or, viceversa, as unity opening up to multiplicity. In Pier and Ocean 5 we see the same expressed in a more dynamic way; the two squares should be in fact regarded as one square in its becoming: the square progressively generates all along the central vertical axis and then higher up dissolves, following an horizontal impulse which opens unity to multiplicity. The spatial development observed in Pier and Ocean 5 tells us that while equilibrium can be attained, it is a dynamic equilibrium that does not necessarily last for long once achieved. Unity reveals itself and then appears again as multiplicity. Recall the example of a tree seen from far and close distance. Everything is one just as every individual thing is a complex set of parts. Modern technology reveals that the apparent simplicity of a leaf is a small universe and that the immensity of earthly nature is a bluish-white spot in the infinite space of the universe. The immensity of earthly nature is as simple as a leaf, which is as complex as the entire planet. Multiplicity becomes unity and unity multiplicity. The square of Pier and Ocean 5 is not a potentially static and all-inclusive unity like the oval but a dynamic unity intrinsically linked to the manifold space in which it is born and toward which it returns a moment later. An external and absolute unity (the oval) is transformed in an internal and relative unity (the square proportion). 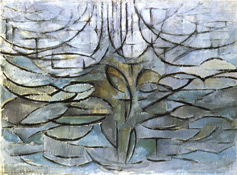 Why is an internal synthesis so important to Mondrian? Synthesis and unity are questions posed by the human being with respect to the imponderable immensity of nature. Mankind and its consciousness can, however, only operate inside the natural universe, as any desire to stand outside it would inevitably entail falling into a surrealistic metaphysical condition. The unified external synthesis expressed with the oval appears to be precisely this, and Mondrian could hardly feel satisfied with it. 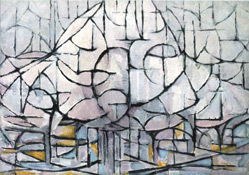 Mondrian used an oval form as early as 1905-06 during the naturalistic period, sometimes around 1909-10 during the expressionistic transition and to a much larger extent between 1913 and 1915 during the Cubist phase. At the same time, however, as early as 1899-1901 the artist had been trying to express a sense of unity which would generate from inside the composition and not be applied from outside of it like the oval. Please click on the four above pictures to open up respective explanatory windows. 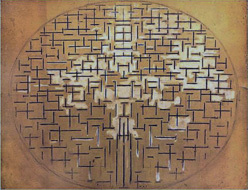 Same as the trunk of the tree (1 and 2) and then a rectangle (3), a square is now a metaphor of the unifying consciousness of mankind dealing with the boundless and multifarious space of the world which is evoked in abstract terms by ever-changing combinations between horizontals and verticals (4). At the same time an appropriate internal synthesis is finally achieved with 4 where unity reveals itself and then reverts to multiplicity. The totality of different things contained in the oval becomes one (the square) and this reverts to the multiplicity contained in the oval. This is now a dynamic unity and no longer the static unity exemplified by the trunk of the tree (1 and 2) or the rectangle in the center of Composition II (3). not something to be attained once and for all like the oval. Establishing equilibrium between the manifold appearance of the world and the synthesis invoked by the consciousness does not mean attaining fixed points and immutable truths. The Neoplastic vision urges us to open up to the manifold aspect of the world both outside and inside, to contemplate all its variety, but without losing our way. This is certainly very difficult in everyday life, where so much fear is aroused in the human mind at the thought of opening up to variety and addressing diversity. All forms of closure, intolerance, and racism are born out of this. 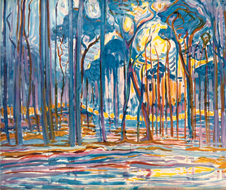 In interpreting the formal relations of Mondrian's paintings, we can develop contents that speak to us about life, not in its fleeting appearances, however, but in its most intimate and authentic ways of being. Mondrian's talent and intellectual honesty ensure that form acquires depth and reveals his intimate vision of things. 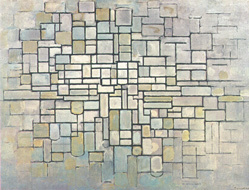 With Piet Mondrian form becomes content and aesthetics acquires an ethical value. On examining Pier and Ocean 5 in the original, we can see erasures and constant adjustment of the different parts. This creates no disturbance and indeed contributes to the dynamic effect of the whole. While using the overall symmetrical layout to keep everything under control, the artist also seeks to disrupt the symmetry by means of a fluid mass of white. 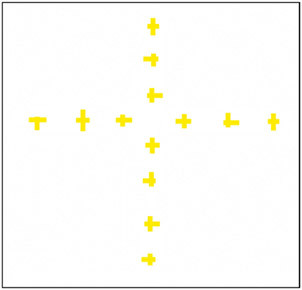 The white mass seems designed to connect the fragmentary discontinuity of the signs by introducing an element that acts more as a painted surface than a linear feature. I see the white as the embryonic form of the color that was to reappear in Mondrian's canvases the following year after this phase devoted exclusively to drawings. 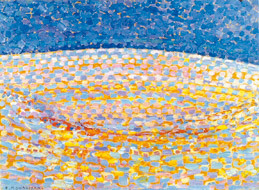 Between 1915 and 1920 the oval form dissolves (2) while a white rectangle (3) and then a white square (4) emerge in the center of the composition amid planes of variable colors (3) and/or different measures and proportions (4). 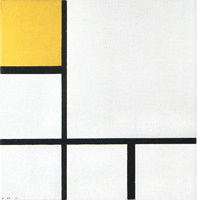 The square form generated in Pier and Ocean 5 was to inform nearly all the works produced by Mondrian after 1920. As mentioned, the square form is a constant feature but in a state of continuous evolution (see images above (1 to 4) and below (5 to 12). As pointed out, the unity formerly expressed with an oval is replaced in 1915 by a dynamic relationship between horizontal and vertical (the square). From then on, the oval is projected beyond the finite field of the paintings to coincide with the reality of the world, of which the canvas constitutes a part; a part that seeks to represent the whole. With the gradual withdrawal of the oval, the square remains inside the painting as the subjective symbol of an assumed but no longer visible objective unity (the oval). If the subjective unity (the square) is to symbolize the objective unity (the oval), it will need to contemplate all of its multiplicity. This is why the painter opens up the square to differences in size, proportion, and color, i.e. to multiplicity. 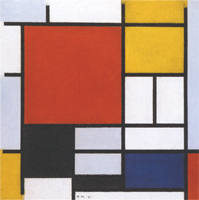 Just as Mondrian chose out of all the possible relations of form the fundamental one expressing the utmost contrast (horizontal-vertical), in terms of color his eye preferred the primary colors yellow, red, and blue because they seemed to him the freshest and the best able to transform the painted surface into a living and exuberant reality. 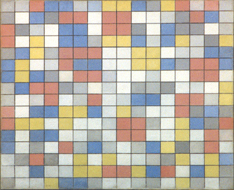 The compositions produced around 1920-21 (4 and 5) present a set of straight lines that generate a dynamic space in a state of unstable equilibrium between heterogeneous entities (planes of different sizes and colors) and an opposing tendency to concentrate and unify that variety in an ideal synthesis of opposite values (the white field in which the black lines attain equivalent proportions). 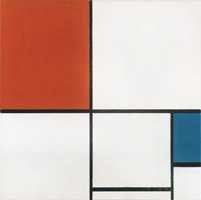 The colored shapes are arranged in such a way as to create asymmetry and "decenter" the square (5). 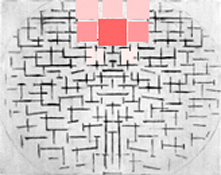 The square expressed with a white field (4 and 5) undergoes duplication to appear once in a larger form in red and once in a smaller form in black (6). 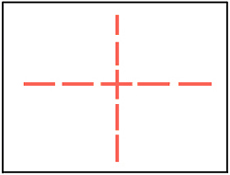 To the right of the large red square and to the right of the smaller black square below, we can see a whitish square field crossed by a vertical segment and a grayish square field crossed by a horizontal segment. 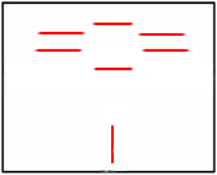 This too is a way of evoking a sense of variation while keeping the space comparatively constant, with four apparently different things being related to the same pattern: a large red square, a smaller black square, a white square with a vertical segment, and a gray square with a horizontal segment. Unity and equivalence of opposites (the square) opens up to multiplicity. In a totally new way, we see here what we have seen in Pier and Ocean 5. 7: the square diversifies now in a more subtle way by means of a slight variation in the thickness of its four sides. 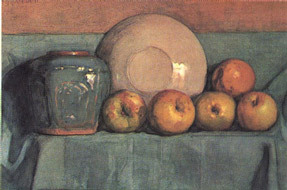 While the elements are reduced, the painter increases their reciprocal diversity with subtle variations, as exemplified in this case by the differing thicknesses of the lines. The whole is thus rich in nuances that help to evoke the sense of multiplicity to which the artist attached such importance, even in a space moving toward ever-greater synthesis. The sense of multiplicity expressed in primarily quantitative terms (6) now gives way to a sense of multiplicity expressed through difference in quality. On observing this square and contemplating the differing thickness of the lines, we are faced with a unity undergoing transformation from one side to the other. We see a unitary synthesis that already appears comparatively manifold in itself. We perceive a changing unity that tends to become rather than to be. It endures but changes at the same time. 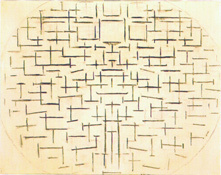 8: The square proportion appears seven times different here through barely perceptible variations in their proportions. The variable thicknes of the lines definig the squares also play a role in differentiating them from one another. 9: A white closed square defined by four black lines (bottom-center-right) shares the space of the canvas with two white open squares (top-right and bottom-left) different in size and proportions. A slice of definite space (the closed square) coexists with slices of indefinite space. 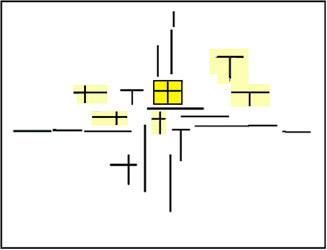 The areas that remain open appear in fact as vertical and horizontal rectangles or as squares only if seen in relation to the sides of the canvas. In actual fact, we do not know how each area develops beyond the boundaries of the painting. 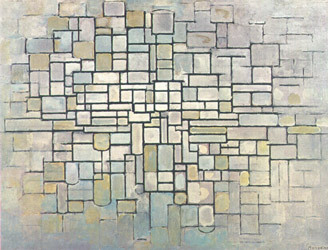 Mondrian appears to have wished to express various possible squares simultaneously a moment before or a moment after they attain equivalence, i.e. to multiply unity. The composition should not be seen as an assemblage of separate entities placed one beside the other but rather as a series of relations through which the same entities are progressively transformed by taking on different shapes and colors. On observing these works, we are faced with a space that lasts and is already different a moment later. The square is always different in appearance but always the same, just as the waves of the sea are always new and different but always made of water. Every Neoplastic composition expresses this dialectic between the changing aspects of life and the human need to stabilize them and find something of greater constancy and duration. A square form keeps space constant while differences in proportion and color change it. We are constantly stimulated by the unforeseeable flow of existence in everyday life and open up to innovation on the one hand while seeking to maintain the integrity of our established equilibriums on the other. The play of equilibrium regards not only form but also very subtle vibrations of color. These works appear to have been painted there and then, thus suggesting intuition more than cool elaboration. The uniformly black lines were transformed around 1940-41 into lines of color. 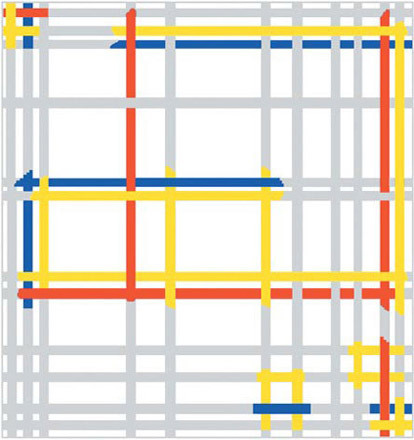 The blossoming of colored lines constitutes a further development in the process of opening up unity to multiplicity; in New York City the squares are in fact simultaneously formed by six or eight lines of different colors. 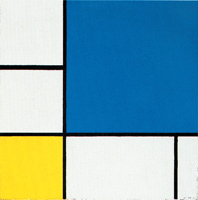 Mondrian seems to have been intent on combining the three colors so as to express a synthesis of yellow, red, and blue, i.e. not only a unity in terms of form (equilvalence of horizontal and vertical) but also, for the first time, in terms of color. The single black and white unity of the early twenties has undergone interpenetration with manifold space and is now wholly imbued with color and dynamism. 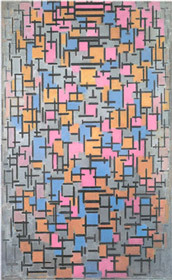 While in no way detracting from the Dutch artist's best-known Neoplastic work, the compositions of black lines and small planes of color commonly understood as his painting, I think I can say that it constitutes no more than a phase along the way in his development of the space that finally came to light in the two last Boogies produced in New York. 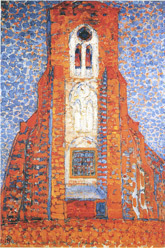 These are the images that Mondrian had on the tips of his fingers all through his career. 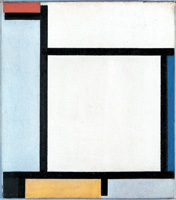 Broadway Boogie Woogie, the last painting Mondrian was able to complete, shows the highest level of multiplicity ever reached in a neoplastic work before the unfinished Victory Boogie Woogie. 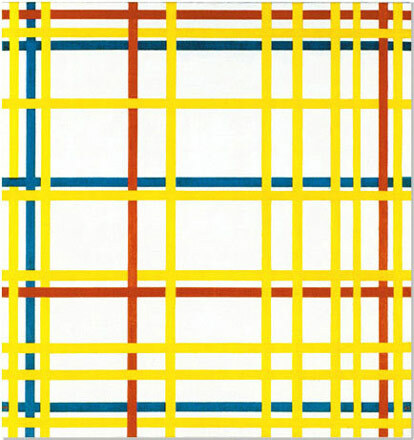 In this composition, for the first time, the unitary synthesis is no longer a white square marked out with black lines or yellow lines, but a concentration of yellow, red, and blue, a free and unpredictable interplay of form that depends on the respective qualities and quantities of the colors. 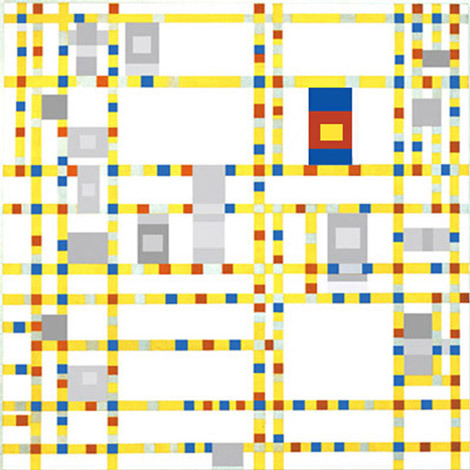 The equilibrium attained in the unitary synthesis of Broadway Boogie Woogie is dynamic in nature and not tending toward the static, unlike the square taken by Mondrian as the equivalence of opposites from 1915 on. While it is true that he had always made flexible and dynamic use of the square form, it is equally true that the square dominated the evolution of Neoplastic space in certain phases, at least up to 1936. 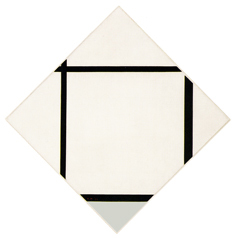 The square form served Mondrian from 1915 to the mid-1930s as a sort of cornerstone or starting point to open his compositions up to change. At the end of this process, his space (Broadway Boogie Woogie) was asymmetric and colored all the way through, simultaneously multiple and unitary. Further details on Broadway Boogie Woogie can be found here.